César Augusto Hernández (pronounced SAY-zahr)… Married Gabriela Altuve; has one daughter, Nathalia Gabriela (9/13/14)… Attended Unidad Educativa Cabriales, where he played basketball, volleyball and baseball… Hobbies: Spending time with his daughter and reading the Bible…Signed by: Sal Agostinelli and Jesús Méndez. Among all NL players, ranked T-1st in bunt hits (8), 3rd in infield hits (26), 4th in pitches/PA (4.25), 5th in walks (95), T-6th in games (161), T-7th in singles (120) and 9th in times on base (252)...Among all MLB 2nd basemen, ranked 1st in walks (94) & times on base (249), 3rd in runs (89), OBP (.358) & SB (19) and 5th in hits (151)... Defensively among all MLB 2nd basemen, was 1st in games started (153), 2nd in innings (1349.2), T-2nd in assists (378) and 4th in putouts (243) & double plays (92)...Led MLB in total pitches faced (3,009); it was the most pitches faced in a season since 2016 (Mike Trout - 3,014 and Paul Goldschmidt - 3,009)...Was the first Phillie to face more than 3,000 pitches in a season since 2009 (Jayson Werth - 3,046)...Set career highs in games (161), HR (15), RBI (60), runs scored (91) & walks (95) and tied his career best with 19 SB (also: 2015)... Led MLB in walks (33) when leading off an inning... Appeared in 161 of the team's 162 games (153 starts at 2nd base and 1 as the designated hitter)...Made his fifth Opening Day roster... Homered on his second consecutive Opening Day, 3/29 at ATL...Matched his career highs with 3 BB and 2 SB on 4/5 vs MIA; became the first Phillie with 3 BB and 2 SB in the same game since Bobby Abreu, 5/19/05 vs STL...Collected his 500th career hit on a bases-clearing, 3-run single in the 2nd inning, 4/19 vs PIT; was the first Phillie to hit a 3-run single since 8/15/78 (Jose Cardenal)... Reached base safely in 28 consecutive games (.367 OBP) from 4/22-5/25, the second-longest on-base streak of his career (most: 29 straight games, 8/24-9/24/16)...Reached base safely in all 5 PA on 5/29 at LAD (2 H, 3 BB); it was the fourth time in his career he reached base safely 5 times in a game (last: 9/24/16 at NYM)... Stole home in the 2nd inning on 8/16 vs NYM (gm 2)...On 9/8 at NYM, tied his career highs with 4 hits and 3 RBI... Homered in consecutive games, 9/15-16, for just the second time in his career (also: 2 straight games, 4/15-16/17)... On 9/30 vs ATL, slugged his eighth career leadoff HR and fourth of the season (others: 5/2 at MIA, 9/16 vs MIA and 9/21 at ATL). Established career highs in doubles (26), HR (9), XBH (41) and runs (85) and tied his career high in total bases (215), despite appearing in 27 fewer games than 2016... Led the team in AVG (.294), OBP (.373), runs, walks (61) and SB (15)... Ranked 2nd in the NL in infield hits (35) & bunt hits (9) and T-9th in triples (6)... Made his second consecutive Opening Day start... Slugged 3 leadoff HR: 4/3 at CIN (Scott Feldman), 4/16 at WSH (Gio Gonzalez) and 5/27 vs CIN (Bronson Arroyo)... Became the fi rst Phillie to hit a leadoff HR on Opening Day since 1938 (Emmett Mueller)... Was on the 10-day DL, 6/10-7/16 (left oblique strain)... Played in 4 rehab games with Clearwater (A) and had 9 walks, including 6 in one game, 7/16 at Daytona... Set a career high with 3 XBH and matched his career high with 3 RBI, 8/25 vs CHI (3rd time)... Recorded a career-best 9 assists, 8/18 at SF... Had a career-best 13-game hitting streak, 7/26-8/9 (.370, 20-54)... Tied his career high with 3 walks, 9/27 vs WSH (8th time)... Reached base safely in 52 of his 59 home starts (.320 AVG and .407 OBP in 64 G)... The Phillies went 24-18 (.571) when he got 2 or more hits in a game. Began the season with Reading (AA)... Was the starting 2nd baseman for the Eastern DivisionEastern League All-Star team (1-2, R)... Collected season highs in hits (5) and runs (5), 4/17 vsRichmond (5-6, RBI, 5 R)... Was promoted to Lehigh Valley (AAA) in early August ... Batted a combined .291 (155-532), 30 2B, 12 3B, 2 HR, 57 RBI, 31 BB, 21 SB, 63 R in 133 games. 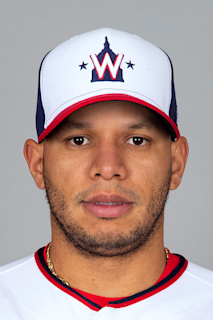 Played for Clearwater (A)...Set professional highs in games (119), AB (421), runs (47), hits (113), HR (4) and RBI (37)...Made all 119 appearances at 2nd base (117 starts)...Played for Bravos de Margarita of the Venezuelan Winter League (.259, 4 RBI, 5 SB). Played for the Gulf Coast League Phillies (R) ... Made 38 starts, all at 2nd base ... Participated in Florida Instructional League. Spent his first 2 pro seasons with the VenezuelanSummer League Phillies (R)...Made 94 starts: 59 at 2nd base and 35 at SS. November 27, 2017 2B Cesar Hernandez assigned to Cardenales de Lara. July 17, 2017 Philadelphia Phillies activated 2B Cesar Hernandez from the 10-day injured list. July 12, 2017 Philadelphia Phillies sent 2B Cesar Hernandez on a rehab assignment to Clearwater Threshers. November 2, 2015 Philadelphia Phillies activated 2B Cesar Hernandez from the 60-day disabled list. November 6, 2014 3B Cesar Hernandez assigned to Cardenales de Lara. September 2, 2014 Philadelphia Phillies recalled SS Cesar Hernandez from Lehigh Valley IronPigs. July 21, 2014 Philadelphia Phillies optioned 3B Cesar Hernandez to Lehigh Valley IronPigs. May 13, 2014 Philadelphia Phillies recalled Cesar Hernandez from Reading Fightin Phils. April 11, 2014 Philadelphia Phillies optioned 2B Cesar Hernandez to Reading Fightin Phils. October 10, 2013 2B Cesar Hernandez assigned to Bravos de Margarita. September 1, 2013 Philadelphia Phillies recalled Cesar Hernandez from Lehigh Valley IronPigs. August 31, 2013 Lehigh Valley IronPigs reassigned 2B Cesar Hernandez to the minor leagues. July 18, 2013 Cesar Hernandez assigned to Lehigh Valley IronPigs. July 18, 2013 2B Cesar Hernandez assigned to Lehigh Valley IronPigs from Reading Fightin Phils. July 18, 2013 Cesar Hernandez roster status changed by Lehigh Valley IronPigs. July 15, 2013 Cesar Hernandez assigned to Reading Fightin Phils from Lehigh Valley IronPigs. June 13, 2013 Philadelphia Phillies optioned Cesar Hernandez to Lehigh Valley IronPigs. May 29, 2013 Philadelphia Phillies recalled Cesar Hernandez from Lehigh Valley IronPigs. March 14, 2013 Philadelphia Phillies optioned Cesar Hernandez to Lehigh Valley IronPigs. October 4, 2012 Philadelphia Phillies recalled Cesar Hernandez from Lehigh Valley IronPigs. August 1, 2012 Cesar Hernandez assigned to Lehigh Valley IronPigs from Reading Phillies. March 14, 2012 Philadelphia Phillies optioned Cesar Hernandez to Reading Phillies. October 10, 2011 Cesar Hernandez roster status changed by Philadelphia Phillies. March 12, 2011 Philadelphia Phillies optioned 2B Cesar Hernandez to Clearwater Threshers. November 19, 2010 Philadelphia Phillies selected the contract of Cesar Hernandez from Williamsport Crosscutters. June 16, 2010 Cesar Hernandez assigned to Williamsport Crosscutters from GCL Phillies. October 8, 2009 2B Cesar Hernandez assigned to Bravos de Margarita. June 23, 2009 Cesar Hernandez assigned to GCL Phillies from VSL Phillies.